You know how they say a picture's worth a thousand words? Well, it's true. And we've got the proof. We caught wind of Jesse and Whitney's work during the earliest stages of our wedding planning. Safe to say it really was love at first sight. No joke. In fact, they were the first wedding vendor we picked; way back when, before we even had a clue as to what our wedding would entail. We just knew we HAD TO HAVE THEM. PERIOD. US: We have no idea where we're getting married, but we have a date. Is that enough? At the time we were sorta kinda convinced that we'd do our nuptials in Telluride, Colorado, a place very near and dear to our hearts. We imagined a ceremony consisting of no friends, just family in the rustic setting of a place we'd grown to love. We (I) pictured an intimate log cabin ceremony, spas and horse drawn carriages. I think our guest count at the time was nine. Flash forward a few months later and we're getting hitched on a farm in our beloved home state of Oregon, surrounded by a plethora of friends, family, and loved ones (and livestock). Suffice to say it was more than nine. A lot more. Nonetheless, our faithful photographers journeyed out West to Orygon like true pioneers, and relished in local seasonal food, Subaru rental cars, gypsy jazz, and warm summer evenings amongst friends new and old. It is truly an honor to be photographed by such caring and creative individuals. At this point it's ridiculous to even refer to them as wedding vendors because they feel more like family than anything else. They were able to capture our day in the most precious, loving, and unobtrusive manner and we have them to thank for solidifying these moments for us. Please see for yourselves HERE. Wow! Those are the most beautiful wedding photographs I have ever seen! And your wedding dress is gorgeous! 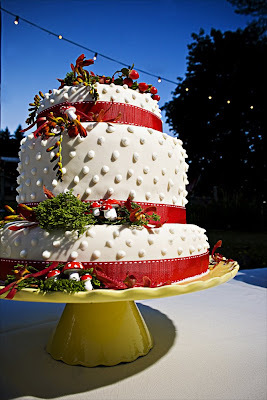 i love how the wedding cake matches the red bike, and the pictures are just fantastic!! what a uniquely beautiful wedding ... congrats! also, if you don't mind, where did you get those bridemaids' dresses? thanks! we are in marthas vineyard enjoying the beach, eating fudge, loving the stiff competition at the agricultural fair, chowing the second best egg sandwiches and thinking of you! thank you for such a kind blog post. we can't thank you enough for making our job the best job EVER! now that we know we both love the vineyard...we'll meet here next year! Those are the most amazing wedding photographs I've ever seen. Ding dong drop dead lovely. Congratulations!